Foot injuries are particularly common in truck crashes due to the automatic reflex that causes people to extend their feet while bracing for a collision. This reaction dramatically increases the risk of bone fractures and soft tissue damage. Heel fractures. 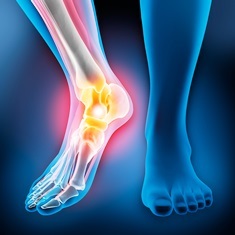 The heel bone, or calcaneus, is extremely strong and hard to break. However, a severe collision can inflict enough trauma on the foot to fracture the calcaneus. These are debilitating injuries, typically requiring surgery to correct. Broken toes. There are 19 tiny toe bones in each foot, and they can easily fracture on impact in a truck crash. Toe fractures are extremely painful, and often slow to heal. Ankle problems. Ankles are vulnerable to sprains, strains, and fractures in a truck collision. Sprains entail the tearing or stretching of ligaments, while strains involve the tearing or stretching of muscles and tendons. These injuries may lead to pain, swelling, and difficulty walking. Lisfranc injuries. Lisfranc fractures are some of the most common foot injuries people face after a truck crash, occurring in both head-on and rear-end impacts. The Lisfranc joint is a section of bones in the midfoot. When a large truck collides with a passenger vehicle, the front portion of the car can be pushed into the passenger compartment, crushing the Lisfranc joint. People who experience this injury are susceptible to infection, and surgery may be required. Arthritis can also develop, leading to lifelong complications. If you suffered foot injuries due to a truck accident, you need compensation for your medical bills, loss of income, and pain and suffering. An experienced attorney will fight to recover the financial damages you deserve. To learn more about what the law offices of Steve M. Lee, P.C., can do for you, visit us on Facebook.